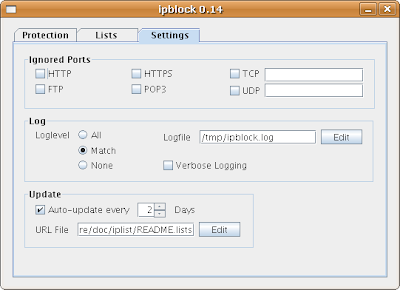 iplist allows users with no or basic knowledge of iptables to filter (e.g. 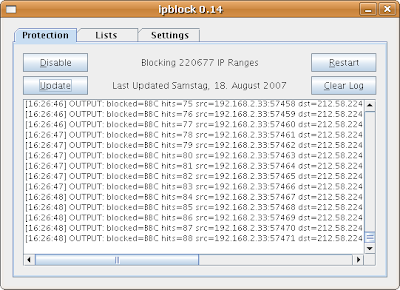 to block) network traffic based on (automatically updated) lists. These lists have various formats and are sorted by different categories (e.g. countries, adware, corporations). iplist requires a 2.6.14 kernel or later with the option CONFIG_NETFILTER_XT_TARGET_NFQUEUE enabled (module or build-in). On a standard Debian installation (Etch) the additional packages libnetfilter-queue1 and libnfnetlink1 are needed. 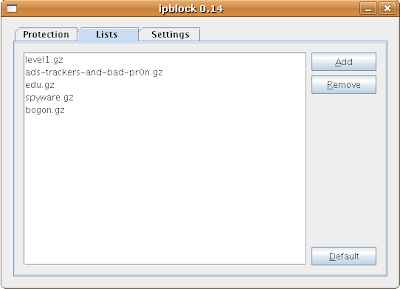 This will install all the required packages for ipblock. All options can be configured in this tab. Auto-updating lists is important and the default choice of 2 days is reasonable. Using out-of-date lists is not recommended. To ignore specific network traffic like HTTP or EMAIL (pop3) use the ignored ports section.